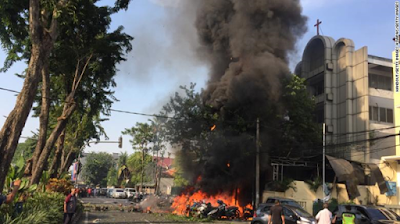 Heavenly Father, we are saddened by the recent suicide bombings in Surabaya, Indonesia. Our hearts ache for the young children who were used to carry out these attacks. We pray that all attacks by ISIS and other Muslim extremist groups will cease. Lord, we pray for our brothers and sisters who lost their lives as they were worshiping you in church on Sunday. We ask for boldness for them as they continue to profess their faith in you. May they live in peace knowing that their true citizenship is in heaven. We also pray for those injured during Monday's attack at the police headquarters. We pray for complete healing for those injured. We are grateful for the police officers who commit to protect Surabaya, and we pray that the injured officers will soon be able to return to duty. Help us all to take heart and to remain faithful in prayer, knowing that you have already claimed the victory. In the powerful name of Jesus we pray, amen.